Last week I went to South Dakota for a family reunion. The main activity is a big picnic at the City Park in Dell Rapids. I’m not very good with large groups so I am not one to mingle and merge and start conversations up. Nor am I into shoving my camera into the faces of people. After the picnic there is kind of an “afterparty” at the homes of one of the relatives and in this lot smaller group I’m a lot more comfortable. The get together itself is great but the house also fascinates me. It has always seemed perfect to me. My great grandfather bought it in the mid 1940’s when he retired from farming and it has been in and out of the family ever since. I remember crashing in the living room one weekend in the late 1970’s during the reunion weekend. So somebody at the get together mentioned that it was designed by an architect named Dow. 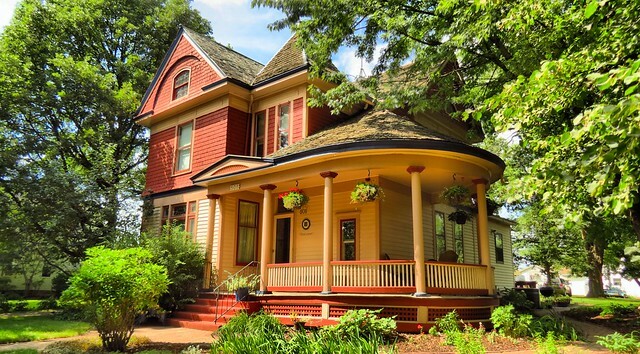 So of course I start googling around and low and behold it I find out that it is a house with a name, the “William G. Milne House” and is listed on the National Register of Historic Places. 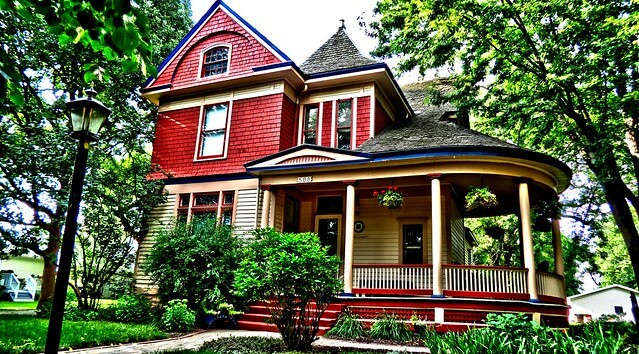 Moreover, it is considered to be a Queen Anne Style house and was built in 1902.. It was designed by a Wallace L. Dow who apparently was a famous architect who designed a great number of public and private buildings during his career. Of course I felt a little guilty thinking about drinking beer on the back porch of such a distinguished house. Not too guilty, just a little guilty you understand. I have a little history with the house. Like I said that my Great Grandfather owned it for a time. My dad has slides from a trip we took one Christmas in the late 1950’s. This a family shot. I’m the good looking guy sitting on the lady’s lap. That lady is my grandmother. Brother Bob is the guy in red at the bottom of the photo. 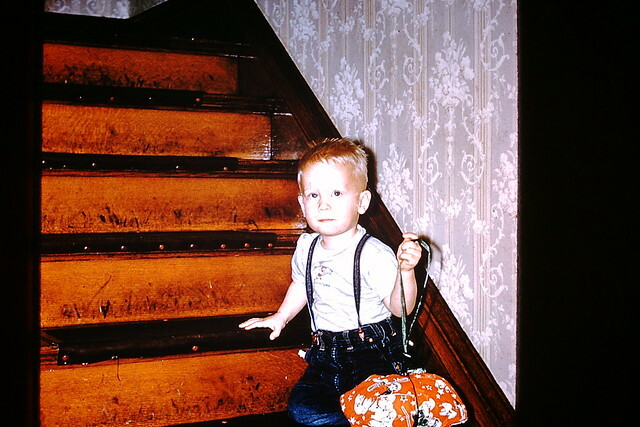 And here is me on the staircase of the house. I can’t believe I had so much hair. Where did it all go? I love those suspenders also. Anyway, I love serendipity. How about you? Have you made some interesting connections lately? 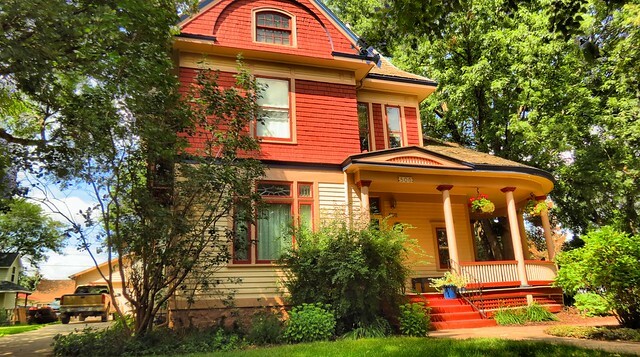 This entry was posted in Boring Personal History and tagged Architecture, Houses, Personal History, South Dakota on August 15, 2014 by Alan Bates. What a beautiful house and garden. Love the “old” photographs but you appear to be a little camera-shy – something you’ve obviously outgrown. 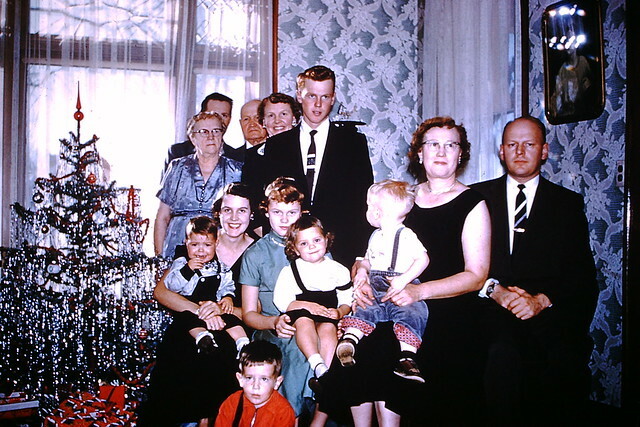 Weren’t family groupings formal in the “olden days”? A colourful house! It looks like it has been colourful for many years. I love that old house and was looking forward to visiting it again. The family picture and the picture of you on the stairs is great. Maybe we’ll get to go back next year.